On the eastern edge of Zholtye Vody, a city of 54,000 in the heart of the Ukraine lies a gaping hole in the earth’s crust that once exposed rich deposits of uranium ore. Nuclear waste was disposed of without regard for human safety. The story has special urgency today because the world-wide energy crisis has brought uranium mining back into production to satisfy the rapidly accelerating demand for fuel. Zholtye Vody is an ecological aftermath which dramatizes the stark choices we must face. 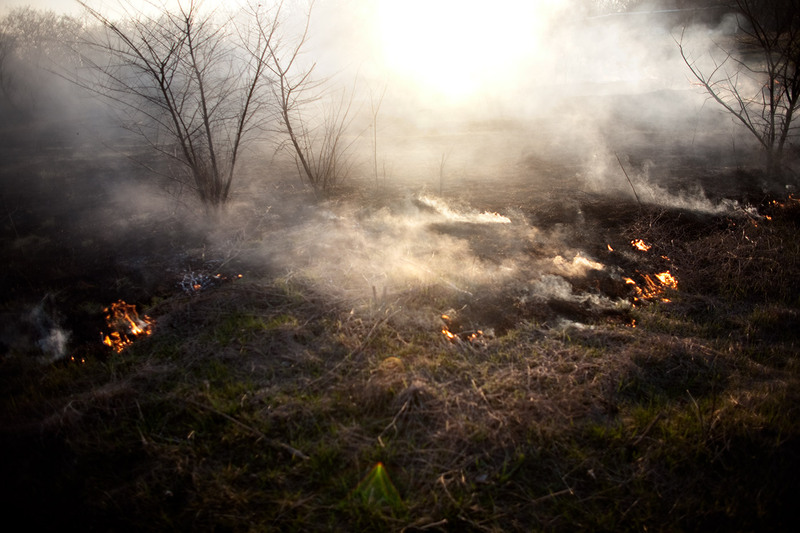 Fire sweeps across a field to rid it of weeds and other problems to clear the field for spring planting in Zholtye Vody, where most of the streets and buildings were built using radioactive waste. Some 4,500 private homes are said to be contaminated with radiation, as well as all the town buildings built in the 1950’s, 60’s and 70’s. The city is slowly measuring the containment levels of all buildings in town. 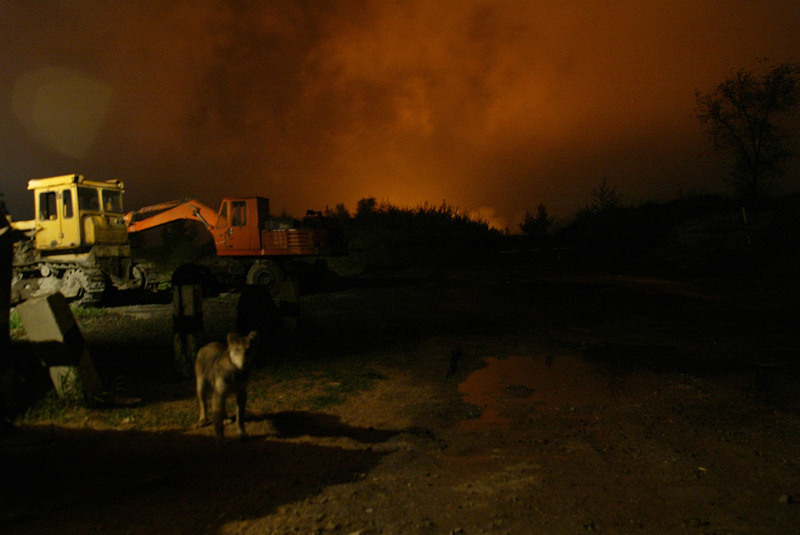 Parts of Zholtye Vody are said to be more contaminated then Chernobyl. A young couple gets married at the Lenin House of Culture, one of the most prominent buildings in Zholtye Vody. In Soviet times, the city was a privileged place to live. The apartments were bigger, there were more personal freedoms and the infrastructure was always at its finest. “Quite contrary right now from the Soviet days,” said Nelly Klepnikova, a resident born and raised in Zholtye Vody, who experienced the privileges of life in those days. 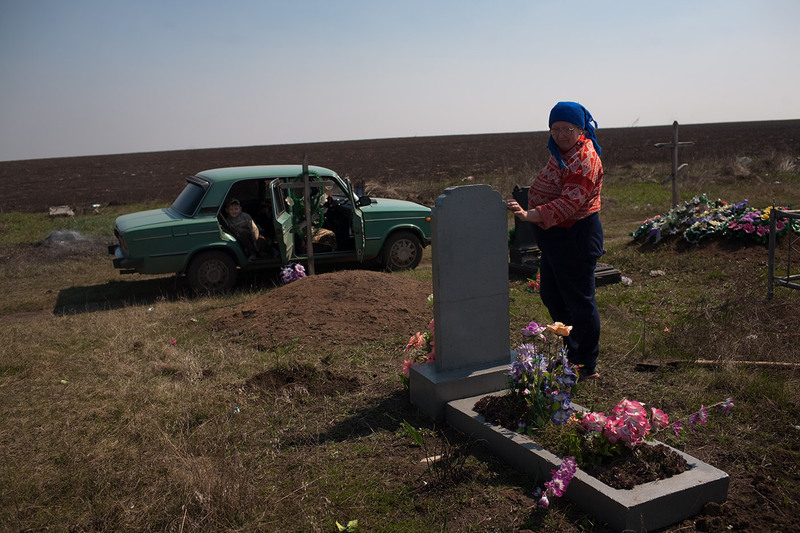 Tamara Belogurova, 52, visits the grave of her sister, Olga, who died of liver cancer in 2008. She was once a chemical technologist at the “Electron Factory,” a facility used to build parts for nuclear submarines in Zholtye Vody. 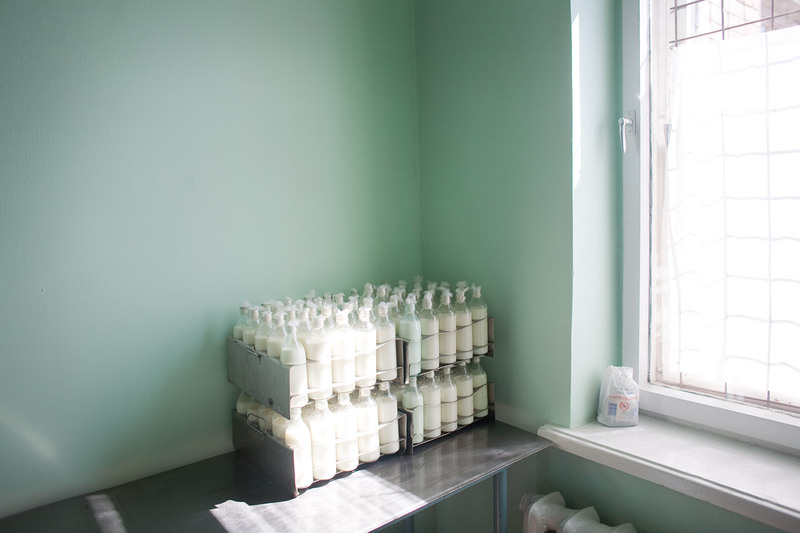 The milk kitchen at the children’s hospital, one of only three centers in all of Ukraine providing milk, kasha and other dairy products for mothers who are deficient in vitamins and nutrients. Many new mothers in Zholtye Vody cannot provide the required amount of vitamins in their breast milk and need to go to the milk kitchen on a daily basis to receive a prescribed formula for their babies. Danil Kravets, 6, has lymphoma. In remission now, Danil’s parents believe his cancer was caused by the “severe ecology in Zholtye Vody.” Many children are contracting lymphoma cancer, and Zholtye Vody has one of the highest rates of lymphoma in Ukraine, along with parts of the Chernobyl region. Sergei Shpetney, 47, died four months after this photo was taken. A former truck driver, Sergei was sent to work on the clean-up of the Chernobyl nuclear disaster just days after the explosion. Residents of Zholtye Vody were told to go work as “Liquidators” at the site, as authorities believed that because they lived in a radioactive town, they would have stronger defenses against potential sickness from Chernobyl. A typical block of apartments built under the Soviet regime. When Zholtye Vody was built in the 1950’s, waste from the enrichment factory was used in the construction of the city’s roads, parks, schools, apartments, etc. This practice continued into the early 1980’s. It has since been discovered that 70.5% of all examined buildings and streets have some level of radioactive contamination. Daily life still goes on, despite the fact that approximately 45,000 of the city’s 65,000 residents suffer from some form of radiation-related sickness. Julia and her father Vladimir, cow herders from the village of Marianovka, watch over their stock of 35 head of dairy cattle. Vladimir says he would never drink milk from his cows because they eat the grasses and drink the water of the Yellow River, located just meters from the edge of the Shcherbakovskaya waste site. When he does have a little milk, Vladimir says he is sick for a whole day with diarrhea and vomiting. Marianovka is said to be the most contaminated village in the area, as it sits downhill and downwind from the waste site, and the village’s ground water is polluted due to the lack of controls at Shcherbakovskaya. At the edge of the dump site, the radiation reads 526 micro Roentgens/hour, on par with some of the worst areas of the Exclusion Zone in Chernobyl. Weapons-grade, enriched uranium, used in former weapons factories, sits buried under layers of concrete in the middle of a field. Some of it is secured by nothing more than an underpaid guard and his dog, sitting inside a chain-link fence. On the eastern edge of Zholtye Vody, a city of 54,000 in the heart of the Ukrainian breadbasket, lies a gaping hole in the earth’s crust that once exposed rich deposits of uranium ore. Of the current population, no less than 40,000 are on hospital records, sick from various radiation related illnesses. This city, which sits on the eastern part of Ukraine close to the Russian border, was at the heart of the former Soviet “weapons polygon” that not only mined and enriched uranium, but also designed and built weapons of mass destruction. Here, death was designed and created for those faraway, but also for the very citizens who worked within this polygon. Nuclear waste was disposed of without regard for human safety. Many of the city’s residential house foundations, major streets and public buildings were constructed using radioactive materials from the enrichment factory and waste sites. Today people display a variety of illnesses which are usually beyond their financial means to treat, such as cancers like leukemia, bone marrow, lymphoma and thyroid, along with congestive lung disorders from nuclear dust and other radiation-related sickness. The story has special urgency today because the world-wide energy crisis has brought uranium mining back into production to satisfy the rapidly accelerating demand for fuel. A widespread nuclear renaissance is not only inevitable but well underway. Global warming is weighing heavily on the international conscience, and with it comes a new-found sense of urgency to dispense with coal and other carbon fuels. The current thinking says that there is no alternative energy more developed, economically viable, and emission-free than nuclear energy. Since world electricity use is expected to double in the next few decades, nearly every industrialized country is considering a fresh build-out of nuclear power. China alone has broken ground on five reactors to feed that nation’s insatiable need for power. The World Nuclear Association says uranium mining would need to increase by almost 300% in the next two decades to meet the need for nuclear energy. Zholtye Vody is an ecological aftermath which dramatizes the stark choices we must face. No one can safely predict whether Chernobyl disasters of increasing magnitude won’t happen again; but Zholtye Vody shows us what happens to civil society, an ordinary urban city, when ordinary technical safeguards fail. 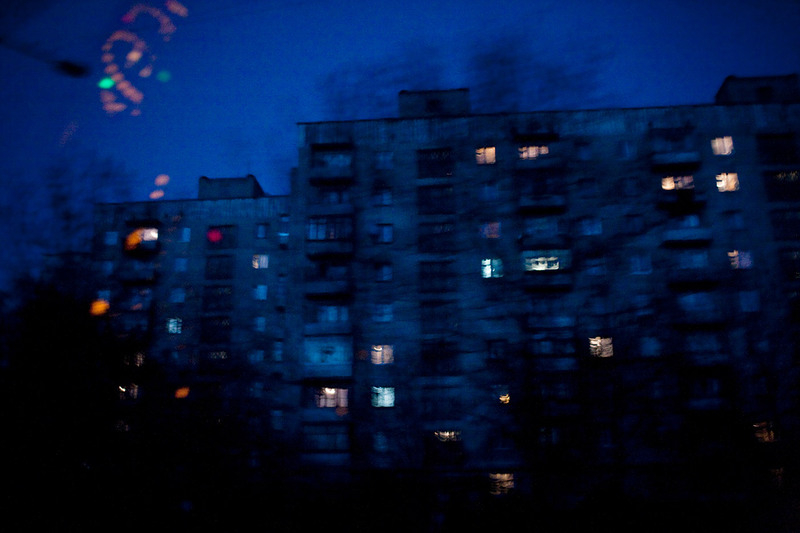 Originally from Toronto, Canada, Don is an award-winning photographer currently residing in Kiev, Ukraine. The recipient of a Guggenheim Fellowship in 2007, he also received the Lange-Taylor Documentary Prize and a World Press Award in 2006. Amongst other citations, Weber was named one of PDN’s 30 in 2008 and an Emerging Photo Pioneer by American Photo Magazine. Don has exhibited widely and has shown work at galleries and festivals worldwide. As a documentary photographer, Don believes in the power of the medium and has been involved in several major campaigns to provoke change. He has completed assignments for such international publications as: Business Week, Der Spiegel, Maclean’s, The New York Times, The New York Times Magazine, Newsweek, Condé Nast Portfolio, Rolling Stone, Stern, Time Magazine and the NGO’s Medecins sans Frontieres, the United States Holocaust Memorial Museum and War Child. Don is represented by the VII Network, an agency started by the members of VII.